A family office and Guest Room in One! 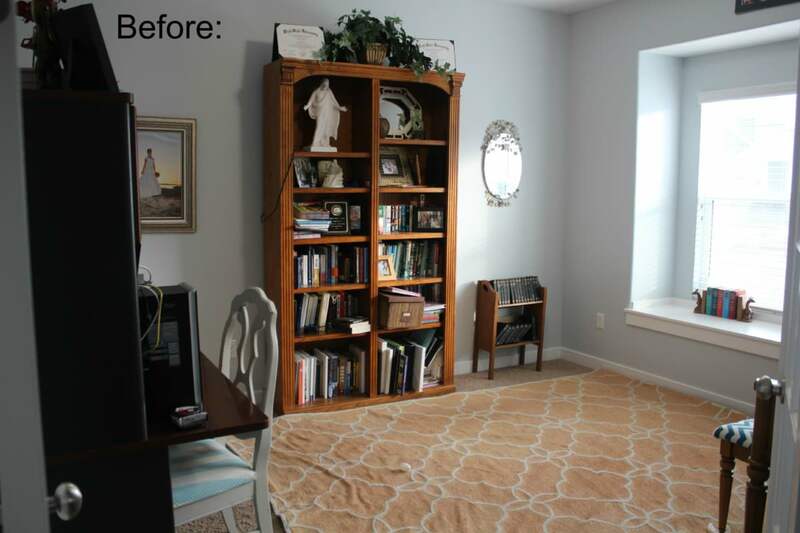 If you caught my post yesterday, you can see a full before pictures of what this room looked like and my journey of turning a rarely used office into a family office and guest bedroom in one that is now one of my absolute favorite rooms in the entire house. 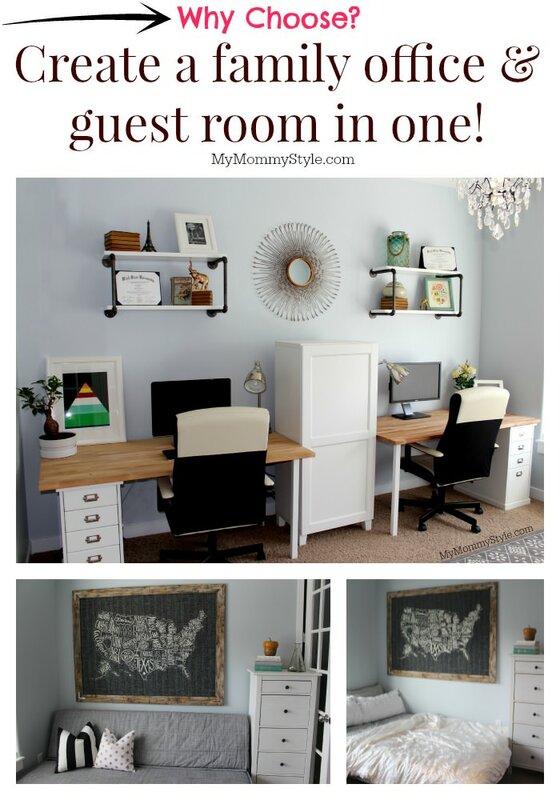 I partnered with two of my absolute favorite companies IKEA and Modify Ink and I will show you how you can create this room for yourself! What a difference! Because I am a blogger and spend so much time on the computer I wanted to create a space that could be used by everyone in the family with multiple work spaces, places to sit, and room to move around. Is it too much to ask for a guest bedroom too? I think not! By taking out the piano that was never used and adding a futon couch/bed this space has transformed to a room that we use every. single. day. I will be sharing a tutorial on how I made the shelves using Plumbing pipe, yes, the actual pipe plumbers use that you can pick up at your local Home Depot. On these shelves I wanted to spotlight items that were important to us, like our Utah State University Graduation certificates and create a HIS and HERS space so to speak. I wanted this office to be elegant and modern, but with a twist to reflect both of our likes and personalities. Paul served his mission in France so I found this Eiffel Tower at a local thrift shop, the books stacked and the vintage Robinson Crusoe are from my Grandpa’s business collection of old books. 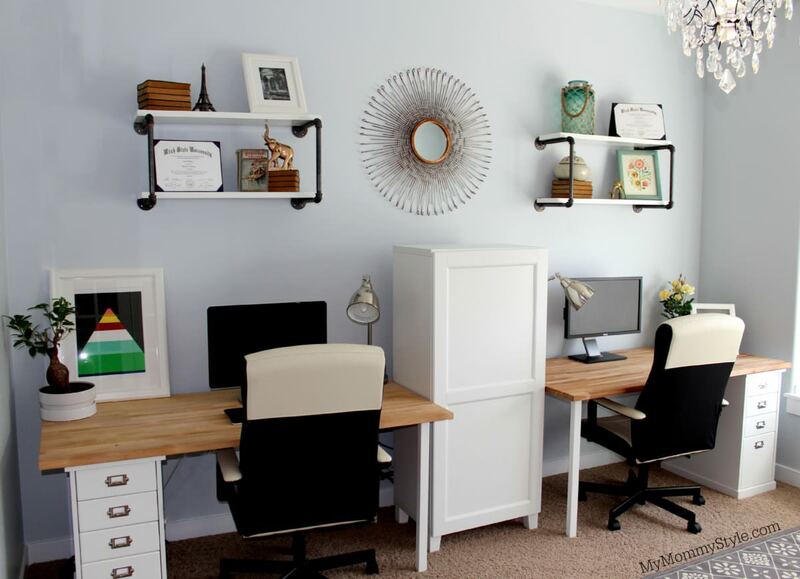 Chairs, shelves, desks (Gerton), rug, lamps, and light are all from IKEA. Storage Unit: IKEA, this comes from the BESTA collection and happens to be one my favorite elements of the room because it hides SO much of the junk that would drive me crazy from our last office space. The shredder, file system, printer, and computer are all tucked away nicely in this unit. I almost want to name him I love it so much. I LOVE these chairs from IKEA! Although they are light in color and I was worried about that with having kids, it is leather and wipes down very easily. I have already spent a lot of time in them and they are extremely comfortable. These drawer units are a new item at IKEA and I love the look of them. I haven’t added labels to them yet, but it I love the shape and look of them. This tabletop is pure wood and extremely durable, I really couldn’t be happier with the light, beachy look it gives to the whole room. In this picture you can see the bookshelf that I added above the window seat. This isn’t a traditional place to put a bookshelf and my husband thought I was crazy for wanting to put it there, but I love the color it adds to that side of the room and we still have access to them if we need them without all of the visual clutter of a more traditional bookshelf. You can find the shelf, rug, and light all at IKEA. This light!!! Oh my! It has TRANSFORMED the office and I love it. I realize it is a little nontraditional to have such a fancy light in an office, but I am a firm believer in the fact that the right light can change the entire feel of a room. I had intended to use another light when I went to IKEA, but saw this one and knew it was the ONE. Best part? You can see this light from the street and it feels like our own little Christmas tree that can be seen from the street all year long. And the queen of the room, if there were a queen, would be this amazing print from ModifyInk.com. Modify Ink is a new company that actually lets you design and change the colors and background of all the prints that they have available so you can tailor it to fit your style exactly. This couldn’t fit my personality any better, and here at My Mommy Style we are ALL about making things your own and appreciating our differences whether that be in the way you mother, design, cook, or eat your M&M’s. This print is the largest print size they offer, it is 60″x 44″ and fit this space perfectly. I love that it is the focal point of the wall and it looks beautiful above the couch space as well as a “headboard” when the bed is laid out for a guest to sleep. You can use the code mymommystyle30 to get 30% off from now until the 14th! This little dresser next to the couch currently holds craft supplies, batteries, and other odds and ends, but would serve perfectly for a space for a guest to put their belongings while staying in your home. The kids have loved reading on this couch or watching a show together if I have some things I need to get done but they want to be close to me. I also love to lay down on it when my husband is doing the bills! These items on top have all been thrifted. I could write a whole post on how to find cute books to decorate with, but I will save that for another time. Just keep in mind your color pallet and check underneath book covers to find beautiful colors and bindings. And voila, it is a bed! niece, Janae’s daughter, comes and stays with us for a few nights every couple of months and she loved having this space all to herself. It is also nice to know that if a guest showed up unexpectedly I would have a space available that stays relatively clean most of the time and has the privacy of doors and close proximity to a bathroom. I really couldn’t love how this space turned out any more! Which leaves us with the last, but not least, gallery wall. Putting a gallery wall together is no joke. I had pieces that I wanted to incorporate into the space, but it all really came together when I added the prints I designed from Modify Ink. The fish print, mountain print, and “Life is Daring Adventure” are all from modify ink. I chose the color scheme for all of them and tried to stick with yellow, aqua, green, red, and gray. This print is from Vintage Revivals that I picked up from Pinners Conference this last year, but it is no longer available on their site. They do have other gorgeous prints to choose from though! You can find this clock from IKEA as well. I loved adding art from my kids collection as well and plan to swap them out every so often to reflect the changes in our family. NOTE: I used 3m velcro strips to hang the pictures to the wall so that I could move them around and not add any extra holes to the wall. I am so happy with how this room turned out and the family cannot get enough of it either! Please let me know if you have any questions and don’t forget to stop by your local IKEA to find these items and join the IKEA family club that is free and offers you discounts and free items in the store. Aaaaand of course, remember to buy your prints from ModifyInk.com using the code mymommystyle30 for 30% off! Hi! I am wondering where you got the pipe for the shelving? That isn’t from Ikea is it? Did you just get it from a Hardware store and rig it together?